The primary objectives of STSA are to disseminate knowledge and stimulate progress in the field of cardiothoracic surgery, and to promote fellowship among southern and southern-trained thoracic surgeons. STSA accomplishes these objectives through its Annual Meeting, making the meeting a uniquely rich and dynamic learning environment where attendees can enjoy the company of their colleagues. A majority of STSA Annual Meeting educational content is derived through the abstract submission process. STSA is currently accepting video and oral abstract submissions in the categories of adult cardiac, general thoracic, congenital, and transplant surgery, as well as history, surgical education, simulations and team-based learning, patient safety, and lessons learned from intraoperative complications for its STSA 63rd Annual Meeting. The 63rd Annual Meeting will be held November 9-12, 2016 at the Naples Grande Beach Resort in Naples, FL. Among the many reasons to submit work for presentation at STSA is the opportunity to be published in The Annals of Thoracic Surgery, the official journal of STSA and The Society of Thoracic Surgeons. Authors selected to present at an STSA Annual Meeting are required to submit their manuscript to The Annals for consideration for publication. In 2013 and 2014, nearly 75% of STSA Annual Meeting abstract manuscripts were accepted for publication in The Annals, which has a circulation of more than 8,000 subscribers. The STSA Annual Meeting an exceptional forum for disseminating your work to the entire specialty. Plus the intimate size and focus on collegiality makes STSA a uniquely energetic and open environment where you are sure to find a lively exchange of ideas. 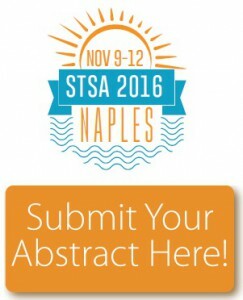 Review the 2016 abstracts submission guidelines and access the abstract submission website at www.stsa.org/abstracts. Contact STSA Headquarters with questions at stsa@stsa.org or 312.202.5892. The deadline to submit abstracts is April 4, 2016.